Our natural resources — our air, our water, our natural beauty, our climate — belong to all of us. We must conserve and protect them. We don’t have to choose between economic growth and protecting our natural resources. Protecting our air and water, building the 21st-century green energy economy, and conserving our natural wealth creates jobs and promotes economic growth. Solar panels and wind farms need to be built and maintained. Millions of American homes and businesses need to be weatherized and improved so that less energy is wasted keeping them lighted, heated, and cooled. Our infrastructure needs massive amounts of investment to be more efficient and more environmentally-friendly. What does all of that mean? 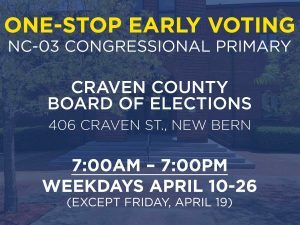 More jobs in Craven County, cleaner air and water, and our nation’s natural beauty and climate preserved as a birthright for our children and grandchildren to enjoy. We’d be fools not to do it.